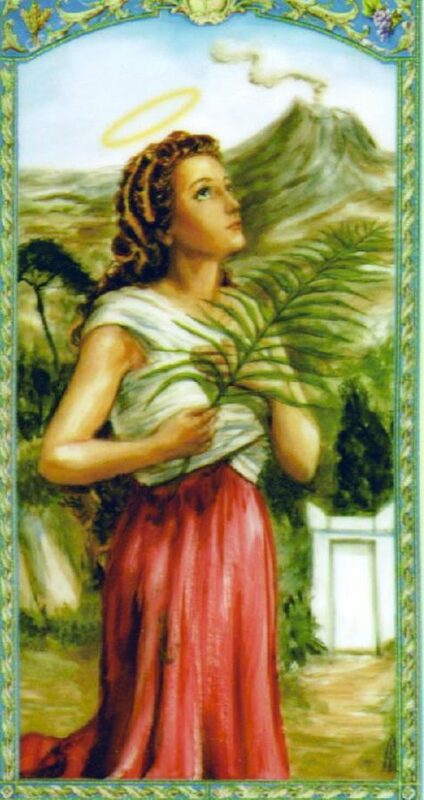 St. Agatha was tortured and martyred in 251 A.D. In addition to many other tortures, her were breasts cut off. 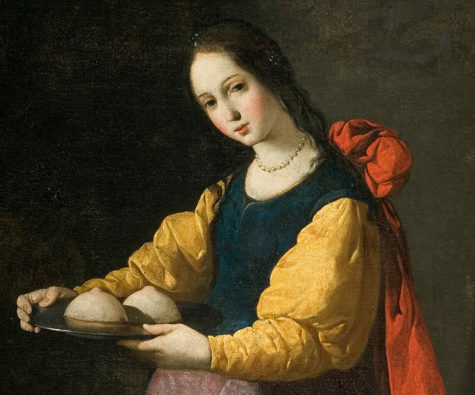 In Catania, Sicily, and other places around the world, her feast day is celebrated with masses in her honor, large processions and symbolic foods, such as le minni di Sant’Agata (breasts of St. Agatha) or le minni di virgini (breasts of the virgin). 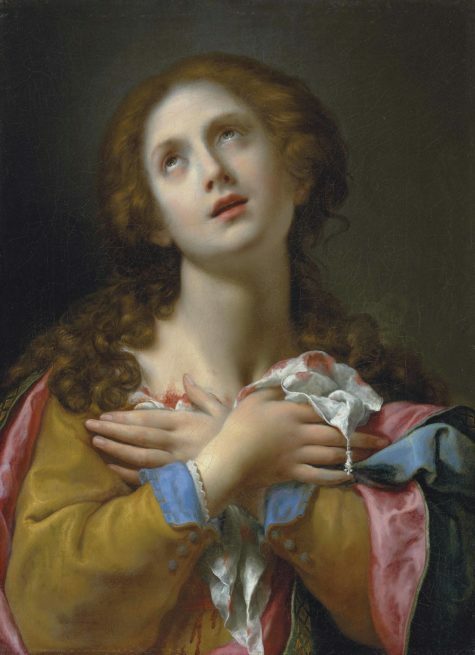 According to the story, not only did 15-year-old Saint Agatha of Sicily refuse to abandon her faith, she also rejected a Roman governor’s advances. As such, she was punished with torture and by having her breasts amputated, then died of her wounds in prison on February 5, 251 A.D. Frescoes of the mutilated martyr are easily recognizable. She’s often depicted holding her breasts on a platter. Each February, hundreds of thousands of people flock to Catania to honor Saint Agatha in a three-day celebration. The centuries-old festival features an all-night procession and delicious replicas of saintly, amputated breasts at every pastry shop. Known as minne di Sant’ Agata in Italian, these sweet cheese and marzipan desserts are an edible reminder of Saint Agatha’s suffering. Bakers craft the perfectly round confections using a base of shortcrust pastry topped with ricotta. After adding in chocolate or a piece of boozy spongecake to accompany the filling, they blanket everything in pistachio marzipan and a thick, creamy glaze. A candied cherry on top completes the anatomically-correct aesthetic. 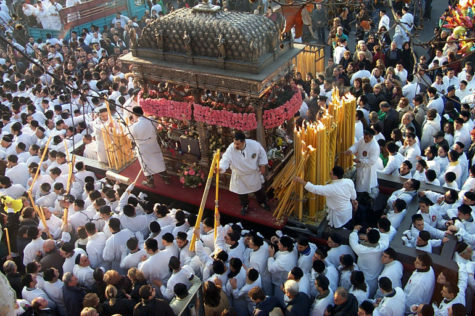 Every year Catania, on the 3rd, 4th and 5th of February, offers to the Patron Saint such an extraordinary festival that can be compared only the holy week of or Seville or the Corpus Domini of Cuzco, in Perù. In those three days everybody and everything is concentrated on this fest, a mixture of devotion and folklore that attracts millions of people, either devoted or tourist. The first day is dedicated to the candles offer. 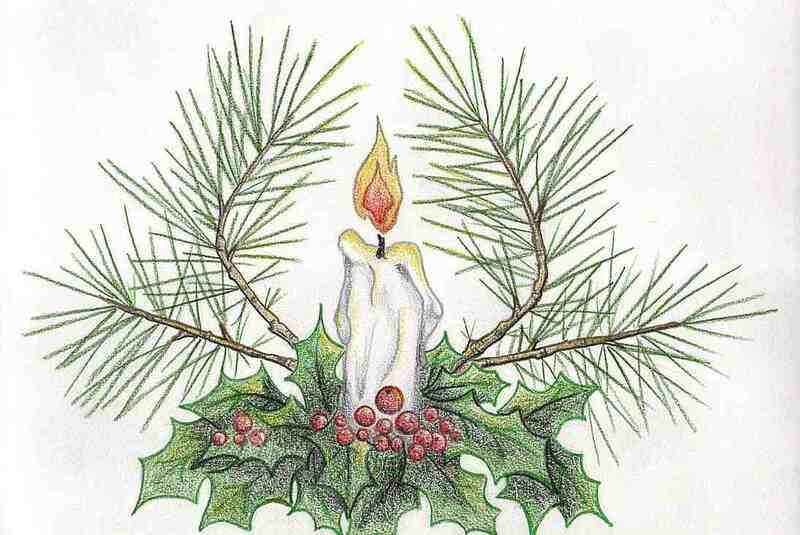 The traditions suggests that candle has to be as tall or heavy as the person that is demanding protection. Two carriages of eighteenth century, property once of the old city government, and eleven “candelore“, big candles, in representation of each corporation, are walked in procession. February 4th it is the most exciting day, in fact it is the first day when the town “meets” the Patron Saint. Already at dawn time, the town is full of people. The devotees are wearing the traditional “sacco”, a votive dress of white cloth, very long and tight up with a string. The “giro“, the procession on this day lasts all day long. The statue is walked in procession through the places of the martyrdom and in this way the story of the “Santuzza” is interlaced with the town story. On the statue, red gillyflowers (martyrdom symbol) are replaced with white gillyflowers (purity symbol). On February 5th, during the day in the cathedral the pontifical mass is celebrated. At sun set time, the statue is walked in procession again, going through the centre of Catania. The most beautiful moment is when the statues goes to through “via San Giuliano” that because of its slope is very dangerous. Prayers for persons suffering from breast cancer. St. Agatha, woman of valor, from your own suffering we have been moved to ask your prayers for those of us who suffer from breast cancer. We place the NAME(S) before you, and ask you to intercede on their behalf. From where you stand in the health of life eternal — all wounds healed, and all tears wiped away — pray for [MENTION YOUR REQUEST], and all of us. Pray God will give us His holy benediction of health and healing. And, we remember you were a victim of torture and that you learned, first hand, of human cruelty and inhumanity. We ask you to pray for our entire world. Ask God to enlighten us with a “genius for peace and understanding.” Ask Him to send us His Spirit of Serenity, and ask Him to help us share that peace with all we meet. From what you learned from your own path of pain, ask God to give us the Grace we need to remain holy in difficulties, not allowing our anger or our bitterness to overtake us. Pray that we will be more peaceful and more charitable. And from your holy pace in our mystical body, the Church, pray that we, in our place and time will, together, create a world of justice and peace. Saint Agatha was a third century Italian martyr who now presides over matters of health and protects homes from fire damage. Many nurses and healers turn to her for assistance in their work. While this saint was a historical persona (not simply a rewritten goddess figure), she certainly embodies the healthy guardian energies of the goddess. Saint Agatha, hear the cry of my heart. That I may stay healthy as long as I live. Let these fires ne’er be neglected. If you don’t have mistletoe, substitute any red colored stone.